I wanted to share some of the DIY’s I made for our wedding last November, partially because I’m wicked proud of them and partially so others might be inspired. There’s quite a few DIY’s that I made, so I’ve decided to post them in segments so as not to overload anyone with the details. I realise there are SO many pins, ideas and photos out there basically showing the exact same things that I’m going to share, but I want to share some of the things I’d do differently in the hope that others will benefit from our experience. There will be some learnings for anyone looking to tackle their own wedding DIY’s. To give you some background, I hadn’t owned, or sewed anything in my life before making things for our wedding. Tackling any of these projects was a momentous step for me, and lead me down the track of feeling confident to attempt quilting, which then reinspired my cross stitching .. So our wedding really was a big milestone in more ways than one! We had a garden wedding, and I wasn’t fond of a red or white aisle runner like so many of the companies in Perth were offering. Red or white wouldn’t have fit our theme, which was casual, relaxed, and a little vintage I suppose. I made heaps of bunting (I’ll get to that later), so I decided to tackle a hessian aisle runner. I realised that aisle runners were actually quite long when I thought about it, and quite wide too. So, I went to my local Spotlight and looked at rolls of hessian in varying colours. Thankfully the rolls were in widths of 1.5m, and I decided this would be wide enough for ours, so I just had to determine the length, which ended up being 8m’s. If you’re using hessian for anything at all, please use pinking shears. 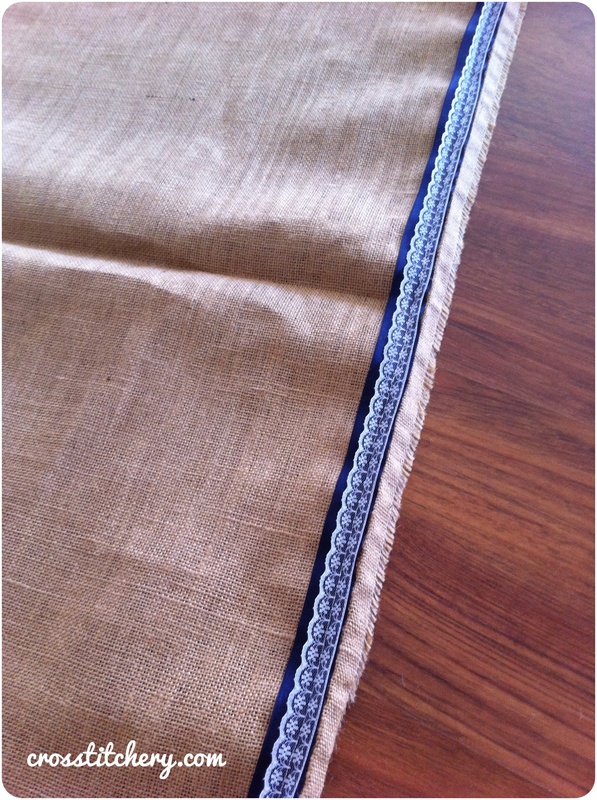 These cut with a slight zig zag, to stop the hessian from fraying all over the place. There were about $30 AUD from my local Spotlight, but they were a great help, and made for a great feature for our bunting (stayed tuned!). Also, take the drink of your choice and place in fridge to chill .. Trust me, you’ll need this celebratory drink later on! Seeing as our was a garden wedding, there was no way I could make a hessian aisle runner long enough to cover the whole distance, so I made it long enough to cover the chairs we had only. Getting 8m of hessian through my baby basic sewing machine was hard enough, so I can’t imagine what 10-15m would’ve been like! Our colour theme was navy blue, lime green and white / light grey accents. 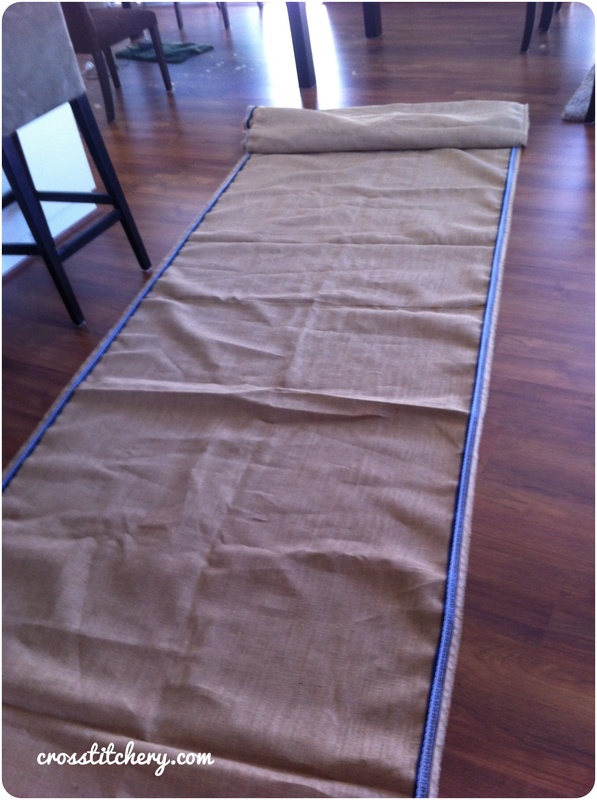 I decided to line our hessian runner with wide navy blue ribbon, and overlay that ribbon with a lace feature. I wanted to avoid having to put that much hessian through my sewing machine, so I tried to pin the ribbon and lace together so I only had to stitch once. This didn’t work. It was too hard to keep the ribbon and lace combination straight, and stop the hessian from curling under the sewing machine so I resigned myself to putting all the hessian through my sewing machine 4 times (1 ribbon and 1 lace layer, for left and right side of runner). 1 thing I quickly came to terms with was that there was no way this was going to be perfect, but I decided I was okay with that because it gave the aisle runner some character. My stitching lines are wonky if you look closely at it, but let’s be honest (insert Pitch Perfect line here), nobody is going to be looking that closely. Once I’d finished sewing the aisle runner, part of me started to worry about all the bits coming off on people’s clothing, and I was particularly concerned with my dress. By ‘bits’ I mean all the hairy hessian parts that fly everywhere when you’re working with it. To combat this, I took the runner outside and gave it an enormous dose of hairspray. Yep, hairspray. I couldn’t think of anything else to use, so if you have a better solution I’m all ears! Patience is a must. Getting that much hessian through your sewing machine is a mammoth task. It took me about 5 hours in total to completely finish it, and I decided to power through it all in one go, which brings me to my new learning. Move any unrequired pieces of furniture, fragile pieces, or finnicky pieces somewhere out of the way. Hessian makes a lot of mess with all it’s little hairy bits, and you just have to embrace that if you want to make one of these. Try and buy a ribbon fabric and lace all in one. If you can’t stitch your ribbon and lace together before you stitch it onto your hessian aisle runner. I don’t know why I didn’t think of it at the time .. It would’ve saved me having to pass all that hessian through my sewing machine so many times, so I’m kicking myself now, but that’s apart of this post .. Sharing things to make it easier on people later. Don’t try and make your ends straight and perfect. Hessian frays, like a crap load, so cutting it straight even with pinking shears is pointless. Just fold the end over when it comes to your big day, and secure it like this .. Your ends will be straight this way! 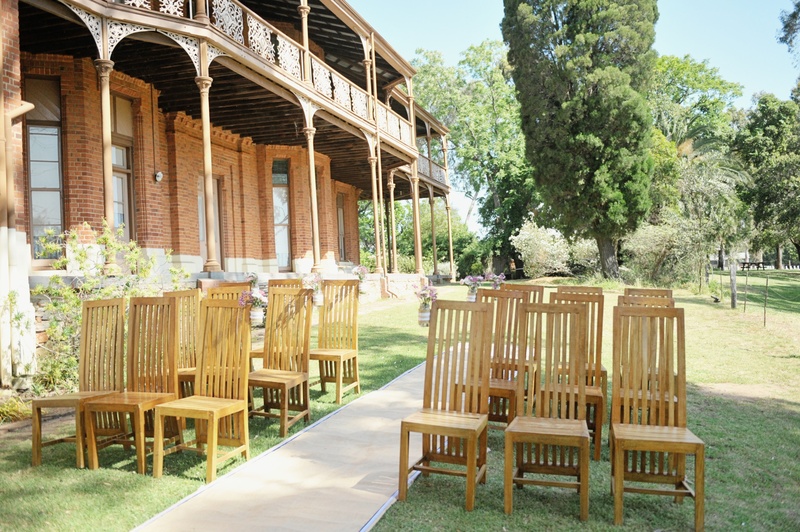 Of that would’ve been lovely, but unfortunately not .. Our wedding was held at a heritage house here in Perth. It’s called Woodbridge House. Pingback: Wedding DIY #2 – Bunting! | crosstitchery.